By Rick “Doc” Doggett, CAP 2-7-2, 1970-71There is sometimes consolation in being lonely. I was without any kind of steady girlfriend during my year in Vietnam. At times that brought pangs of loneliness, especially when other guys got letters from their girlfriends. Those letters always seemed to brighten their lives in the bush as members of CAP 2-7-2. I received mail from family members, but had no special love interest. The people who remained on the homefront, a.k.a. “The World,” were our link to the lives we remembered somewhat distantly after awhile, but longed to return to. The letters and packages became tangible demonstrations that somewhere people cared about us as individuals, remembered us when we were young and innocent, and longed for our return. Letters from mom and dad were nice, but not as nice as the letters guys received with all sorts of emotional and suggestive descriptions of how much they were missed. At first I truly wished I had someone at home who cared about me that much. But only at first. I dated a beautiful young lady named Vicki during my senior year of high school, and had taken her to our prom. We had many things in common but had the sort of weird, awkward, intense relationship that happens between two people with strong feelings and little expertise in expressing them. We were both immature and, frankly, scared to death by the emotions and passions that arose when we were together. 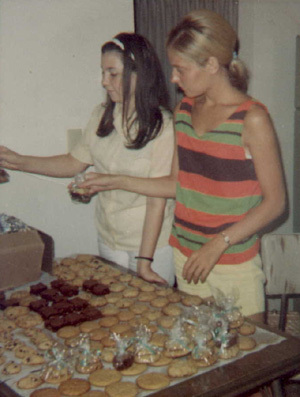 Vicki at right and friend Nancy pack cookies to send to Rick Doggett in boot camp. We graduated shortly afterwards and as Vicki went off on her senior trip, I started one of my own. She wrote to me at first, while I was in boot camp. She also sent a huge box of goodies for me and the men in my company that she and another close friend, Nancy, had baked. It was a great feeling to get that box, made and packed with such care and affection. Unfortunately, it was soon followed by the traditional “Dear John” letter. Vicki had decided that as a pacifist and war protestor, she could no longer be associated with a warrior like myself.In the tradition of sailors and Marines for 200-odd years, I saddled up and drove on. A year later I arrived at CAP 2, without having any kind of serious relationship in the meantime. I was single, unattached and unloved. It took a couple of months, but I gradually realized that being unattached had some advantages. Shortly after beginning life in the bush it became clear that I was unlikely to survive a tour in a CAP. My predecessors and successors were all medevaced, either KIA or WIA. I expected to meet the same fate and began to accept that reality. However, that fatalism was far from being a bad thing. Accepting that my time would come when it came, and not before, freed me to do my job without worrying about survival. Once you accept that you will not survive, you can focus without fear on doing what needs to be done. So I made peace with my fate and stayed relaxed, confident, and unafraid. As it happened, I was the only corpsman known to complete a full tour in CAP 2-7-2. Little did I know that Vicki had been worrying about me during that time, but had no direct source of information. She often wondered over the years if I had survived Vietnam, until one day in the early 70s she saw me at a pizza place in our hometown. I was with my then-wife and Vicki did not approach me. As it happened, she felt guilty about the “Dear John” letter, and couldn’t face me. I also thought about her often over the years, wondering where she was and how her life had turned out. Eventually, I found the answer. Twenty nine years after we separated, a mutual friend mentioned to Vicki that I was in town. Vicki called me and suggested it would be fun to get together and rehash old times. We met for dinner where it turned out we were both single again. The rest, as they say, is history. Vicki and I attended the 1998 CAP 2-7-2 reunion in Kansas City together, and six months later were married. We now live in the town where we grew up and it seems as if life has finally turned out the way it was intended despite the long detour caused by the war. We both realized that despite distance and time, we were always in love and meant to be together. I treasure the fact that Vicki knew me before I was changed by the war, and she knows the smiling, innocent boy still lives inside me. Vicki has realized that you can hate war, but love the warrior. And I have realized that I hate war as much or more than she does. She asked me once, while we were enjoying some cuddling, if I would do it again.